Do you want to be immersed in Japanese? Or are you too tied down to get yourself to Japan this week, month—or even this year? But what you do need to do is make yourself a Japanese rabbit hole to jump down, into Japanese Wonderland. In your house. Right now. Think about that word for a second: immersion. Your target language should surround you! If you’re here, you probably know all the different methods to get right down into the nitty gritty with immersion: Japanese movies, television, manga, podcasts, radio, cartoons…it’s all golden. And I’ll go out on a limb and bet you ended up here because you just pressed pause on a drama to find out how you can better understand Oguri Shun. Ever notice how after you’ve been buried in an anime or drama hole for an extended period of time, you get up to go grab a snack and your mind is still buzzing with the Japanese you’ve just heard? You may even be absorbed in some task and realize you’ve just been talking to yourself in Japanese (hopefully in your head). For the same reason you can remember the tunes of songs without actually knowing the lyrics, the more you are exposed to spoken Japanese, the more you’ll internalize the flow, the sound and the inflections of what’s being said—even if you couldn’t catch every word. Instead of having to consciously grind out every single word in a conversation with a very patient postal worker, you’ll think of a Japanese sentence as a whole entity. As you start to sing the tune of Japanese in your head, it’ll become less labored and more of a second-nature. Got that Japanese buzz? The goal of your immersion project is to prevent that buzz from going away. So we already have endless resources (thank you Internet gods! ), and you’ve been watching Japanese dramas like it’s your job, but what are you doing with the rest of your time? You may be exposed to Japanese every day, but there are still tiny, minuscule cracks of time hiding from sight. We’re going to fill those cracks in with Japanese! おはよう！(Good morning!) Wake up! What’s that sound pulsing you out of your precious sleep? If it’s not an upbeat Japanese tune, you’ve already missed an opportunity to immerse yourself in Japanese today. If your phone is your alarm clock, download a song in Japanese that you particularly like. Once you’re even half-conscious, you’ll be singing along in Japanese as you jump out of bed. You might have to switch it up occasionally, but if you’ve got a really good one, you better believe you’ll have it stuck in your head…all…day. If you don’t eat breakfast, you should; it’s delicious and nutritious. And it’s another opportunity for Japanese immersion! While chowing down your Apple Cinnamon Cheerios, you could be putting your mind to better use here, even at the expense of others at the table (sorry roommate/family member/significant other). Get a Japanese podcast in your ear, review your textbook unit from yesterday with the CD or listen to arbitrary newscasts. All right, so you don’t want to be rude… just leave one earphone in and keep the other ear open so you can respond to social cues. While secretly being anti-social. Fluency or bust! Then you’re out the door, in the style of every high school anime known to man: coat on one arm, toast in mouth, schoolgirl skirt fluttering….oh, you don’t wear that to work? My bad. So you’re on your way to work/class. Heads up: Every single mode of transportation allows for Japanese exposure. Bus, train, car, bike, motorcycle, scooter, vespa, you name it. You can either put those earphones back in or throw a CD into the player and listen, shadow and respond to prompting conversations from your textbooks. Ignore the world and keep immersed, but please don’t knock into telephone poles! You betcha. Once you’re at work/school/wherever, your instinct is going to be to climb out of your Japanese hole and get down to business. These cracks of time are a little tougher to see, as everyone has responsibilities and situations that demand interaction in your native language. Try this: During any time you get to yourself (solo tasks, paperwork, sitting at the computer doing research), put on your headphones. If you can do it, listening to some background Japanese is going to take you that extra step in immersing yourself as much as possible. Music, podcasts, go! People are absolutely going to want to interrupt you during your break. To them, you’re not really doing anything. How are they to know you’re knowingly avoiding them because of the demon native tongue that pollutes your Japanese Wonderland? As soon as you’re on lunch, or just taking a 15-minute breather, make it your sanctuary. With your arms full of Japanese books, manga or vocabulary textbooks, run—don’t walk—to your break space and submerge. The more in your Japanese headspace you can be, the better. And if you’d really like to be polite (keeping good coworker/family relations and whatnot), then take out that one earbud and let them know you’re studying Japanese. Tell them what you’re trying to do in a short and friendly conversation, and they’ll (hopefully) be less likely to interrupt you when they see you with your headphones in, staring intently at a book with gibberish on the front cover. You’ll probably be able to get by with a friendly wave of recognition next time. Think about your workspace: your notebooks, your bulletin board, anything in your view during your day. When you look up from your computer, what’s around you? Inspirational quotes? Newsletters? No good! Make those things on your wall Japanese, in any way that you can. Look up inspirational Japanese quotes and proverbs, or even get a poster full of all the kanji you need to pass the JLPT. Just watch out for these ones—good indicators that you need to study more (read them carefully). And what do you see on your computer screen? You could make your desktop background one of those Japanese proverbs from your wall, and set your home page on your favorite browser to a Japanese news site. Be sure to bookmark FluentU in your browser, too! 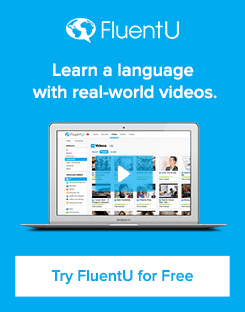 FluentU takes real-world videos—like music videos, movie trailers, news and inspiring talks—and turns them into personalized Japanese learning lessons, which are perfect for your 15-minute breaks at the office! All right, we know we all get tired and fed up at the end of a long day. Overtime, traffic was terrible, some guy was a little closer than he needed to be on the train…I get it. It is so easy to throw off your coat, throw down your bag, grab a bag of chips and slump onto the couch, where you become tree fungus. You won’t move after this, let’s be honest. Rather than following that Pied Piper into reality TV darkness, stay vertical, keep moving, and instead of turning on the TV, turn on your dramas. Turn on your Japanese tunes as you whip up a batch of Japanese curry, while reading all the cooking instructions in Japanese and jamming out to The Blue Hearts—rockin’ all the words. The day was just the hard part, now you get to fully jump in and frolic about in your Japanese Wonderland, with minimal interruptions. And if the interruptions love you, they’ll forgive you while you do obscenely off-putting dance moves in the kitchen. What did you do during your break today? New vocabulary? Some new grammar structures? Awesome new slang? After your kitchen dance-off, kick back with whatever input you got today and bask in your mastery of it. Just refresh those words in your mind, maybe repeat a few phrases and engage in a familiar drama or even an interesting documentary (go knowledge!). Constant exposure to unfamiliar input is good for your training, but don’t forget to solidify your basics as you go, so you’re steadily building a good arsenal of grammar and vocabulary that will lead to understanding more and more of the unfamiliar. Another great way to review, and a highly important step in your studying and immersion, is to get online with a language exchange partner and turn input to output. Talk about your day, what you’re doing tomorrow, ask them about their plans, etc. Your brain should be dying to bring to the surface some of that language which has become the norm in there. You’ve eaten, studied, gotten all cozy in bed…but your Japanese immersion is not over yet—no, no. You’ll be tempted to take a break from Japanese and relax with a book in your native language. That’s a cop-out and you know it! Grab some Japanese reading material (graded readers, children’s books, vocabulary books, novels) and nestle in to learn, review and watch your studying pay off. It may be a tad frustrating when there’s so much input but perhaps you haven’t been keeping up with your language exchange appointments. It’s difficult to see where all this immersion is getting you. But there are a few small indicators that you are getting somewhere. Think: Because you’ve been absorbing all this natural Japanese, hearing real sentence structures in practice and recognizing where people tend to insert “ne,” you’ll find yourself almost unconsciously becoming more comfortable with the sound and the syntax. You won’t have to think about it as much. You’ll find that some actions narrated by your inner monologue are even described better in Japanese than they could be in English. Take onomatopoeia for example: In Japanese they can describe complex emotions. Spectacular! When you get that inner monologue running, you may find that you’ve developed another aspect of yourself: your Japanese voice. Dream: One debated “benchmark” in your Japanese progress (which is really just fun when it happens) is waking up one morning and realizing you’ve just be dreaming in Japanese. You might have had a nonsensical conversation with a sheep, but you recognized that you were hearing and understanding Japanese. Now, as dreams are a bit of an otherworldly space, this is—as I said—a debated subject among expats and students of Japanese, but it’s a possible indicator of how far you’ve been immersing yourself in this lovely language. Those markings on your kanji posters, those frustratingly unfamiliar words, that fear you get in front of your language partner…that will all pass if you want it to. In time, it’ll start to feel less like diving into an unexplored ocean in January, filled with unknown creatures, and more like sinking into a warm, familiar, sweet-smelling bath. Feel-good sensations and all.